The public transport system for the Madrid region is a complex inter-modal system, consisting of various modes of transport: city and suburban buses, metro, light rail and suburban rail services. 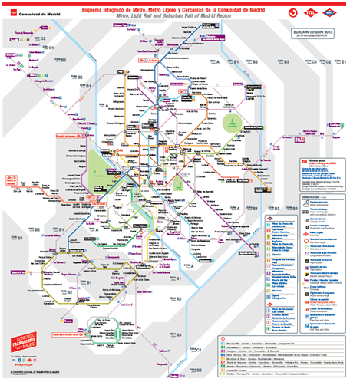 •	The urban area of the city of Madrid: around 204 EMT city bus routes, 12+1 underground lines and one light rail line, and 34 suburban train stations. •	Metropolitan area of the region: 111 city bus routes, over 439 suburban lines, 4 underground lines and 3 light rail lines and 9 railways lines. Both subsystems are connected by a series of large interchanges that surround the central area of the city of Madrid, channeling the radial mobility between the capital and its metropolitan ring. They are usually located on the major access roads to Madrid, thus linking with the services offered by the associated suburban bus, as well as the big national and international intermodal hubs (airport, railway and long distance bus stations, etc.). Metro de Madrid, S.A., which operates the underground system, is a public company owned by the Region of Madrid (100%). EMT, which operates bus services in the city of Madrid, is wholly owned by Madrid City Council. Private companies, 31 in total, operate the suburban bus services. Most of them are grouped on two associations called Fenebus and Asintra..
Cercanías-Renfe, a public company dependent on the Spanish Ministry of Public Works, operates suburban rail services. 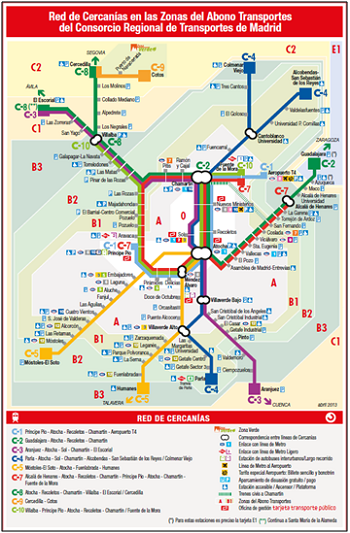 Light rail concessionaires: Metro Ligero Oeste S.A., Metros Ligeros de Madrid S.A. and Tranvía de Parla S.A. In addition to these operators, there are a number of equally significant companies: the rail company TFM, concessionaire of the Line 9 underground extension; the MetroBarajas S.A. society, concessionaire of the connection of airport T-4 terminal; and the Fuenlabrada municipal bus transport company.